So the big downside to travel is you cannot cook. However the upside is you get to eat crazy yummy food cooked by others. 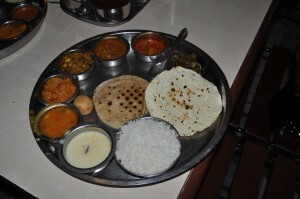 I have been a fan of Indian food for years, but in the US they do not have this phenomenon called a Thali. It is a huge metal plate, with small metal bowls filled with various kinds of yummy Indianess with room in the middle for Roti or Chapati. Luckily the Gopi Dining Hall in Ahmedabad was happy to teach me all about them! Going from left to right we have; some sort of sweet milky thingy (I think to counter act the spicy stuff, but not very good), a soup, a cauliflower sort of thingy (ok but not as good as the next 3), something involving peas and green beans (crazy tasty belly), dal, and a spicy potato curry. The round ball shaped thing in the middle is some sort of sweet potato thing, best when dipped in the spicy green sauce. The men who work in the place (and its all men) then continually come around to bring you more Roti and refill any of your little dishes that look empty. They will also, if you are two American girls on your own, stare at you while you eat (not creepy at all). In additional to be super yummy its also crazy cheap, about $6 for two people, plus the two Cokes we had. Am now pondering tossing in this whole public health thing and opening a Thali restaurant in DC. 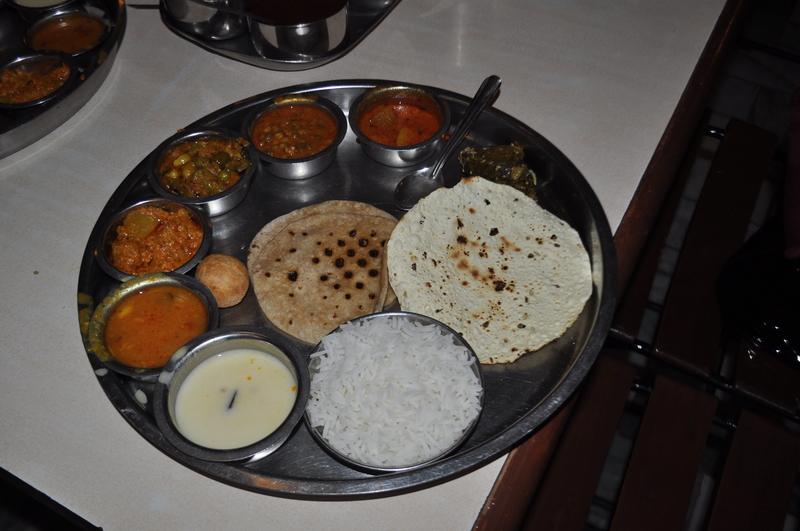 *as described by the hubs when telling me that I needed to find Thali while in India. Bento boxes and thalis are like the combo meals of Asia.